Have you ever felt undervalued and underappreciated? Many event managers/planners feel this frustration because they simply aren’t able to show how the annual corporate event is positively impacting the business or corporation. The fact of the matter is that the corporate event itself is an investment into the future and not an instant addition to the bottom line. This means that without clearly defined expectation in the form of KPIs it is impossible to measure the outcomes. What makes this even more difficult is that different stakeholders are looking for different outcomes. The CEO will have a different agenda to the Sales Team and attendees will be on another page altogether. To ensure the success of our clients – event managers and event planners we have developed a “Secret to Success Formula”. 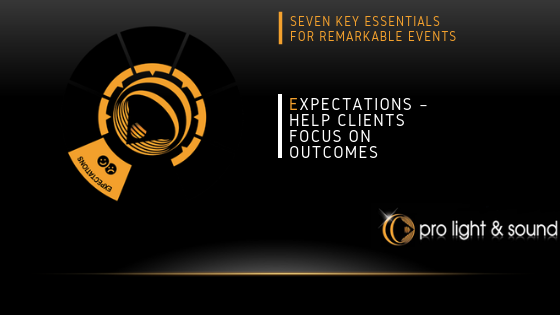 A formula based around the Seven Key Essentials for running remarkable events or as we refer to it: the SEVEN “E‘s”. “EXPECTATIONS” is the first “E” in our formula. Setting the right expectations prior to organising the event is imperative to success. You must start with the end in mind and identify the expected outcomes for each stakeholder and attendees. Knowing the expected outcomes and the impact this event will have dictates the direction, style and scale of the event. Clear understanding and Focus on Outcomes will help with budget and strategy. Ensuring a measurable result. With 30 years experience in the event industry, we understand the struggles our clients face and have developed a methodology that guarantees a great result every time. We work with seasoned professionals and first-timers implementing our proven step by step process to help them plan and execute their events. We know that only when our clients look good, we look good. That’s why we are the most creative audiovisual supplier dedicated to delivering memorable experiences with truly measurable results. If you are an event manager or event planner looking to stand out in your organisation, help us, help you. Get in touch with a Pro Light & Sound expert and we will help you implement our proven formula so can go from undervalued to irreplaceable.